It must be my Greek heritage, but I love hearty veggie and legume packed soups. They are a great way of getting vegetables and plant-based protein into your family. Oh, and they are super beautiful because of all the colorful veggies! Because our food should look as good as it tastes! I was inspired to make this soup after seeing it in the hospital cafeteria a few months ago. 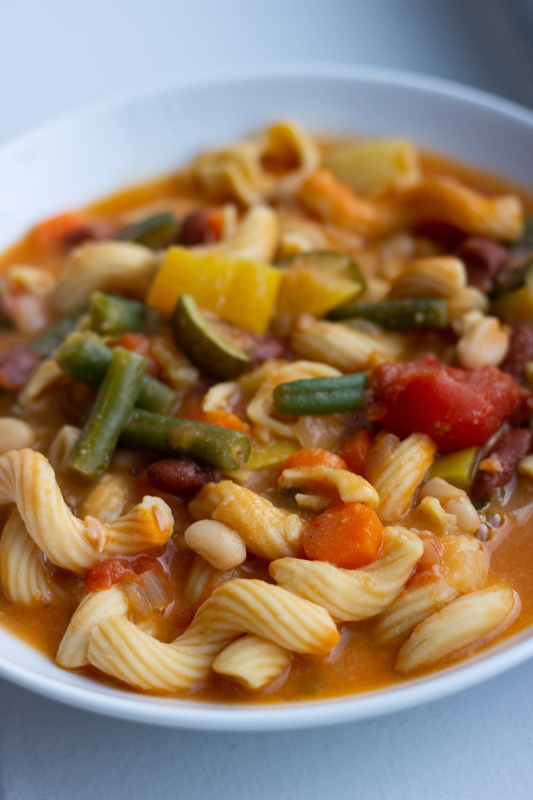 My knowledge of minestrone soup was a mix of beans and vegetables with a small shape pasta (like orzo or ditalini). 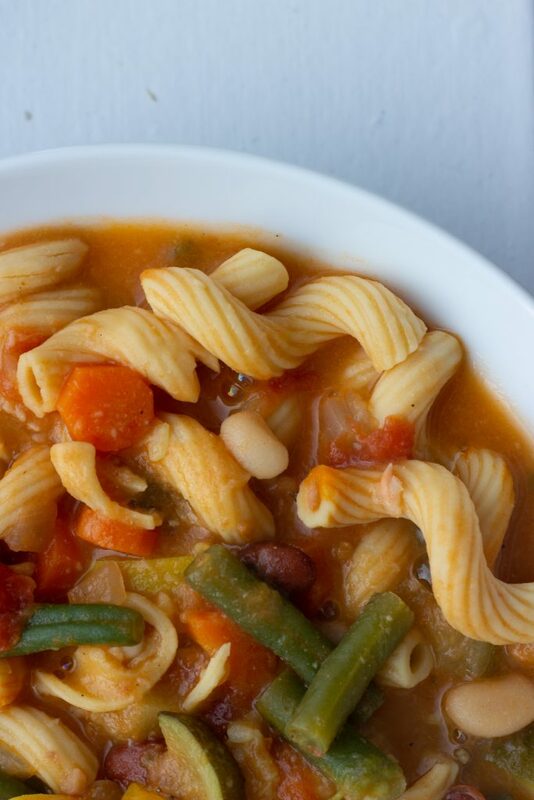 But when I saw that the chef at the hospital made minestrone with cavatappi (large spiral pasta), I knew that I had to recreate this soup at home. To bump up the protein a bit (because #veganlife for Lent), I used Banza pasta cavatappi. Since Banza is made with chickpea flour, it’s higher in protein than traditional pasta. This soup turned out amazing and was everything I ever wanted in a cozy winter dinner! This recipe is also so amazing because it’s so simple. Chop. Dump. Stir. Simmer. Eat. The hardest part is actually washing/chopping all the vegetables! Since everything goes in all at once, I prepped all the veggies first before starting to cook. I used the more traditional veggie mix of yellow squash, zucchini, onions, green beans, and carrots, but you can use whatever vegetable medley you like! When you’re all prepped and ready to cook, grab a large heavy-bottomed pot and set it over medium-high heat. Add in some olive oil. When the oil is hot, add in some chopped onion and cook until soft. Then dump in all of the veggies and cook until they just begin to soften and take on some color. Then you dump in a 28oz can of whole tomatoes that you have mashed up with your hands or that you cut with kitchen shears. Add in some low sodium veggie broth to cover the veggies by at least an inch. Add in two cans of beans (your choice, but I did kidney and Great Northern beans) and add the seasonings. Simmer covered for 15 minutes and then remove the lid and bring to a boil. Add in one 8oz box of Banza cavatappi and cook for about 9 minutes, or until the pasta is done. Note: some of the pasta will disintegrate… but that actually helps thicken the soup slightly (so it’s a win!). This soup is best served/eaten immediately, but I reheated it in both the microwave and on the stove the next day with good results! You might need to add a splash of veggie broth or water while reheating as the soup thickens while it cools! This is definitely in the winter dinner rotation! A protein- and veggie-packed soup that is perfect for early spring days! In a large heavy-bottomed pot set over medium-high heat, add in olive oil. When the oil is hot, add in the onions and cook until soft. Add in the squash, carrots, zucchini, and green beans. Cook for 3-5 minutes until just slightly tender. Add in salt, pepper, oregano, and red pepper flakes. Stir to combine. Add in the crushed tomatoes, beans, and vegetable oil. Add some water to the pot until the liquid level is one inch over the vegetables. Bring to a boil and then simmer covered for 15 minutes. Remove the lid, bring the soup back to a boil and then add in the Banza Cavatappi. Cook for about 9 minutes or until the pasta is tender. Serve immediately!